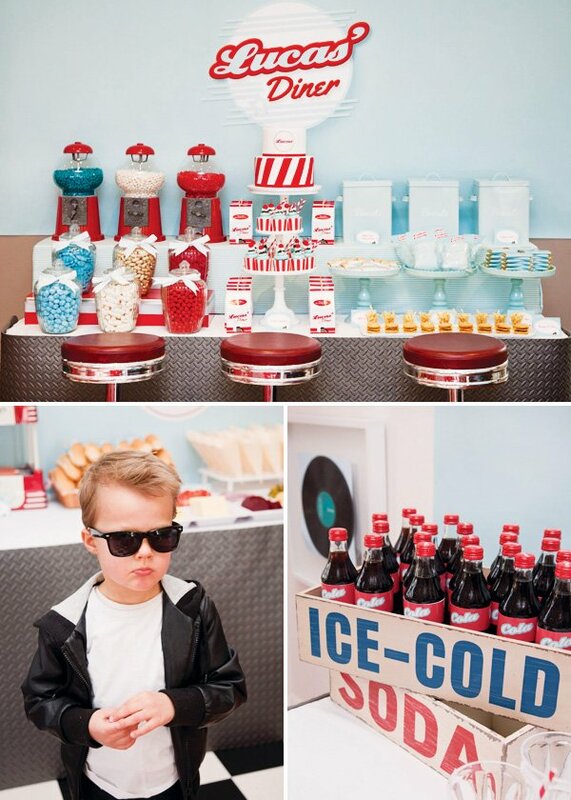 Belinda of Styled By Belle rocked some serious style together for her son’s Retro 50’s Diner Party! 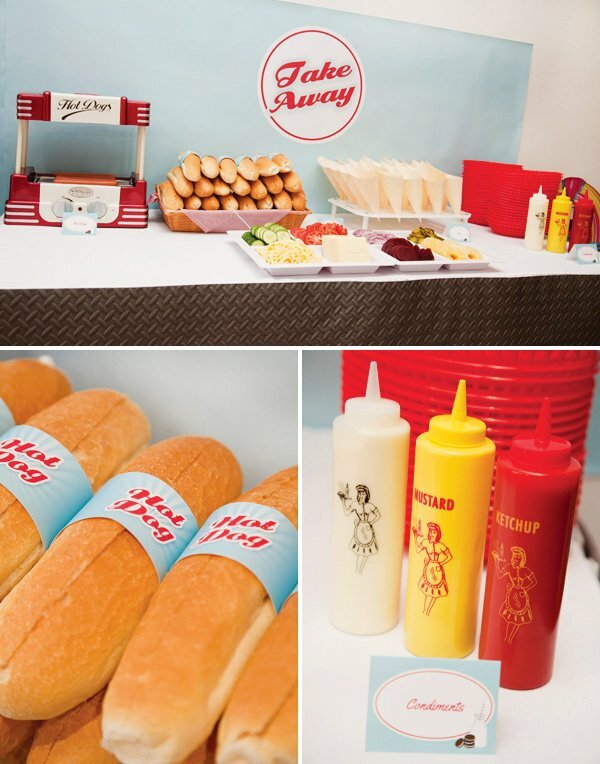 She really brought a diner setting to her own home, from the classic diner lunch food, retro serviette dispensers and table numbers to the amazing macaron hamburgers & milkshakes for dessert! 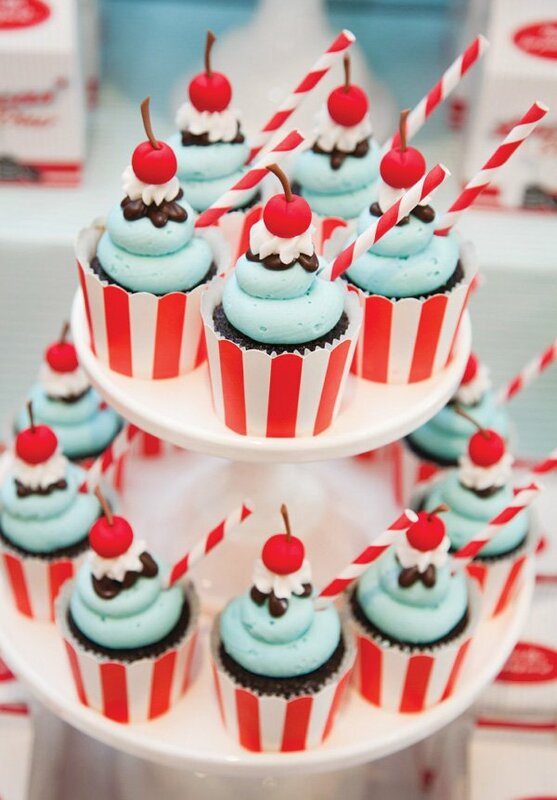 Adorable sundae cupcakes with a striped straw & fondant cherry on top! 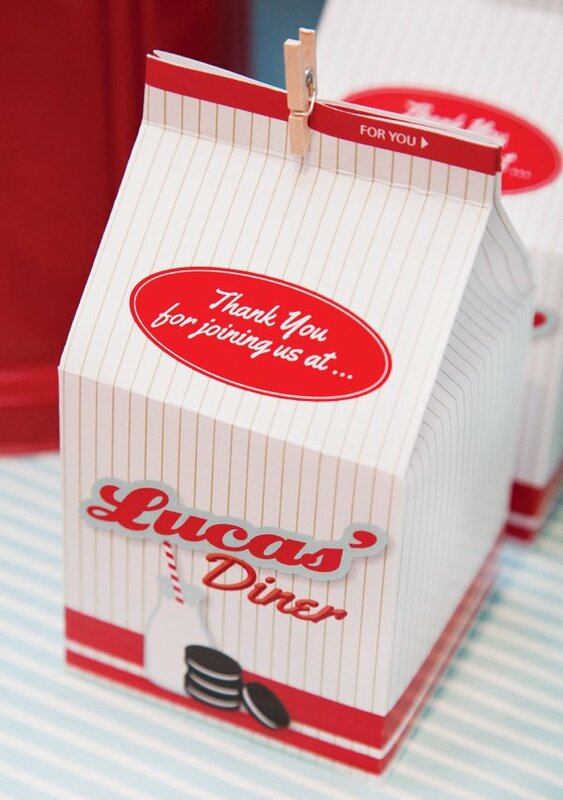 Awesome custom take-out gable boxes for party guests! 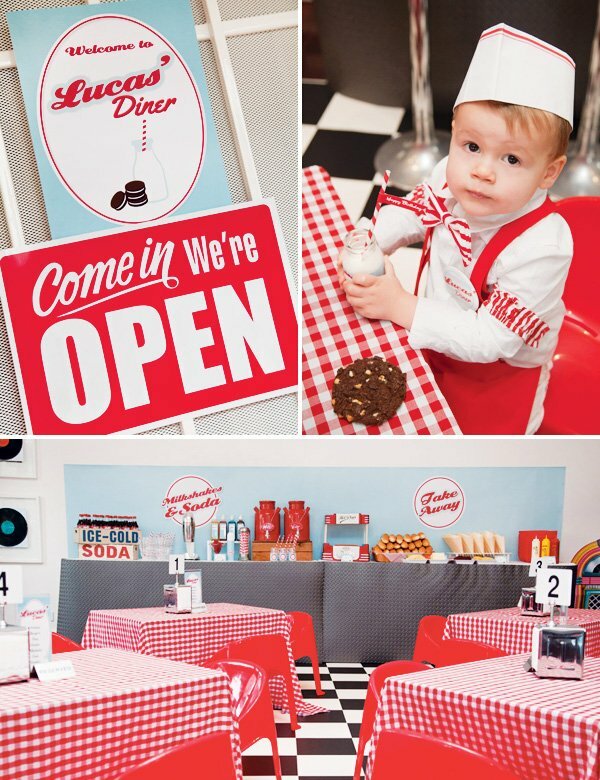 I recently styled my son Lucas’ 2nd birthday party – which was a “Retro 1950’s Diner” themed party. We converted our lounge room into a little rock’n’roll diner. 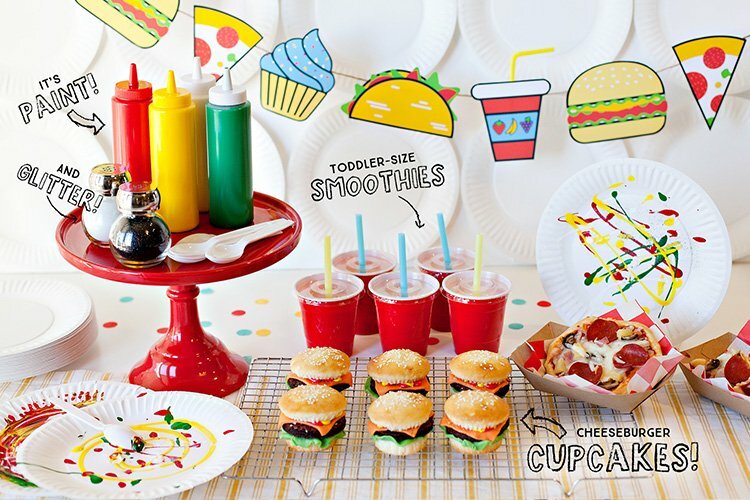 It had cafe style seating for the kids to sit at diner style tables, a delicious sweets table, a “Milkshakes & Soda” station where guests could make their own milkshakes; and a “Take Away” station where lunch was served. 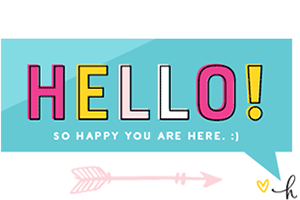 Elise from Sweet Scarlet Designs, designed a “retro” themed party stationery collection for me. While the party was a 1950’s diner, I wanted to keep the party young and suited to a 2-year old, so Elise incorporated “cookies & milk” into the design which went really well with the theme. 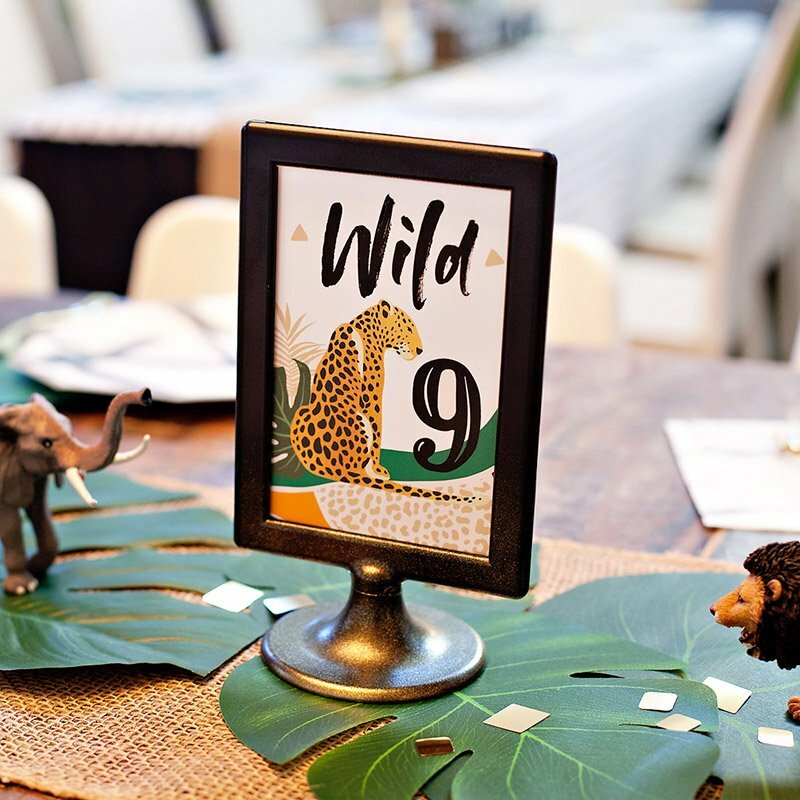 The design collection included a cute invitation and all the printable elements for the day including buffet food labels, bottle labels, straw flags, favour boxes, thank you tags, as well as the backdrops I had printed to give the “diner” feel. Being a retro diner, of course we had to have some black & white chequered floor, so I sourced some checkerboard vinyl flooring sheet which we placed in the middle of our loungeroom – which the guests had fun rock’n’roll dancing on later in the day. For the kids seating, I set up 4 little tables. I put red & white chequered fabric on them for tablecloths and hired red chairs. On the tables I placed retro serviette dispensers and put table numbers on them along with little DL size menus I printed and put in Perspex sign holders. It really completed the little diner look! We had 3 food and drink stations around the perimeter of the room. I found checkerboard look rubber flooring mats from our local discount store which I cut to size and stuck to the front of the buffet tables to give a café feel. The printed backdrops really set the scene for the diner. 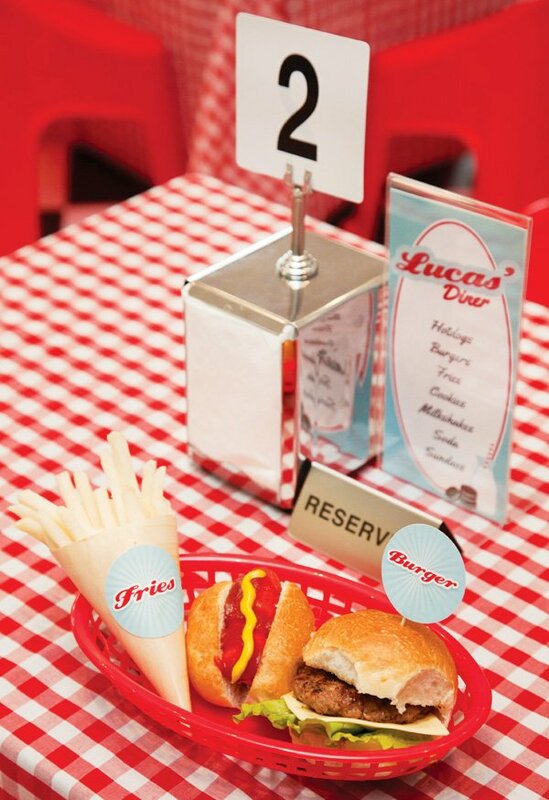 Lunch was a diner inspired menu consisting of burgers, fries, hotdogs, milkshakes, cookies, sundaes & soda. 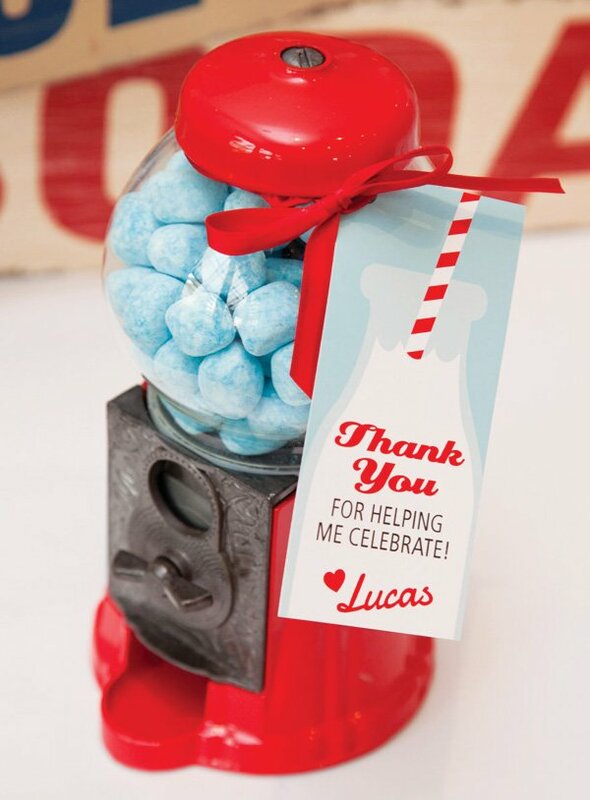 At the sweets table, we served delicious treats including cupcakes made by Kiss My Cakes that looked liked “sundaes” with the striped paper straws in them and a cherry on top! 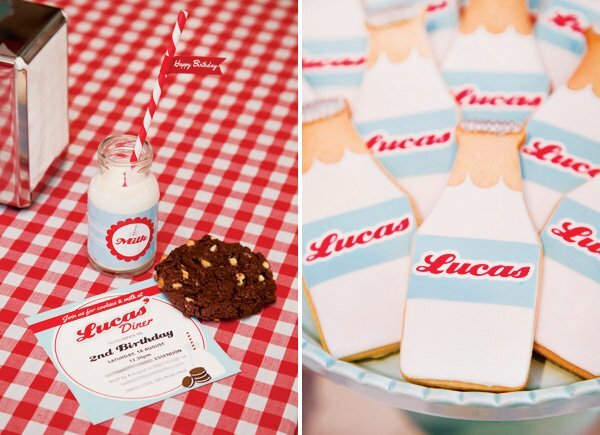 We also had adorable sugar cookies in the shape of retro milk bottles and had Lucas’ name printed on them. One of biggest talking points of the party were the macarons, made by Macarahrah, which were made to look like little hamburgers. There were 2 macaron shells sprinkled with sesame seeds (representing the hamburger bun), a slice of white chocolate (cheese slice), chocolate filling (meat pattie), raspberry sauce (tomato sauce) and mint leaves (lettuce). They were absolutely adorable and tasted yummy as well! 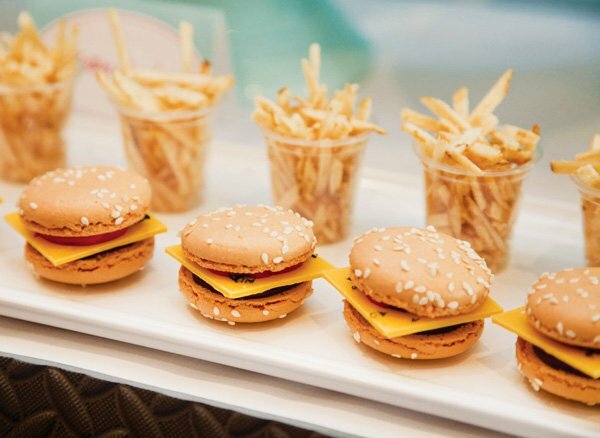 I served this with little shot glasses of “French Fries” chips, so guests were able to order their “Burger & Fries”. 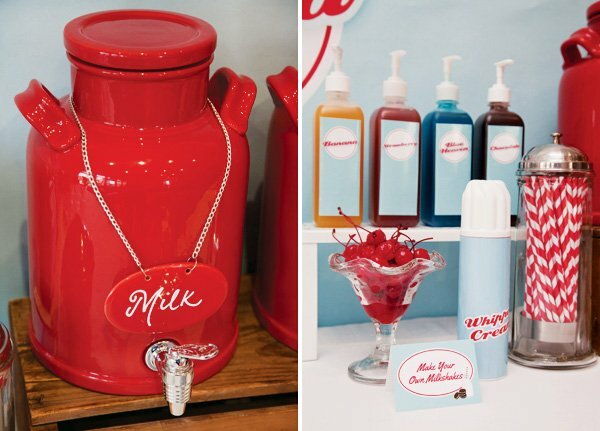 Guests loved making their own milkshakes at the drinks station. We had a milkshake mixer and 4 different flavours (chocolate, strawberry, banana and blue heaven) to choose from. We dressed Lucas up as a little “soda jerk” and he looked adorable in his little outfit. He wore white jeans and shirt, red braces, red striped bow tie and matching arm band. He also had an adorable white soda jerk hat to wear, along with a little red apron. The guests also dressed up for the occasion – the boys came in jeans, white tees & leather jackets – we also gave them black sunglasses & toy guitars to complete the look. For the girls, my Mum helped me make little rock’n’roll circle skirts which we gave to the girls to wear with matching ribbons & neck scarfs. The girls wore their own white tops and little bobby socks. They looked fantastic and it was very reminiscent of the John Travolta & Olivia Newton John “Grease” movie! Wow this amazing. Don´t you think? I Love it! My friends lovwe to Swing Dance and I could see this being a great party for swing dancers and non-dancers to eat, hang out, and dance. Where did you get the red beverage dispenser? It is so cute! Oh. My. God. 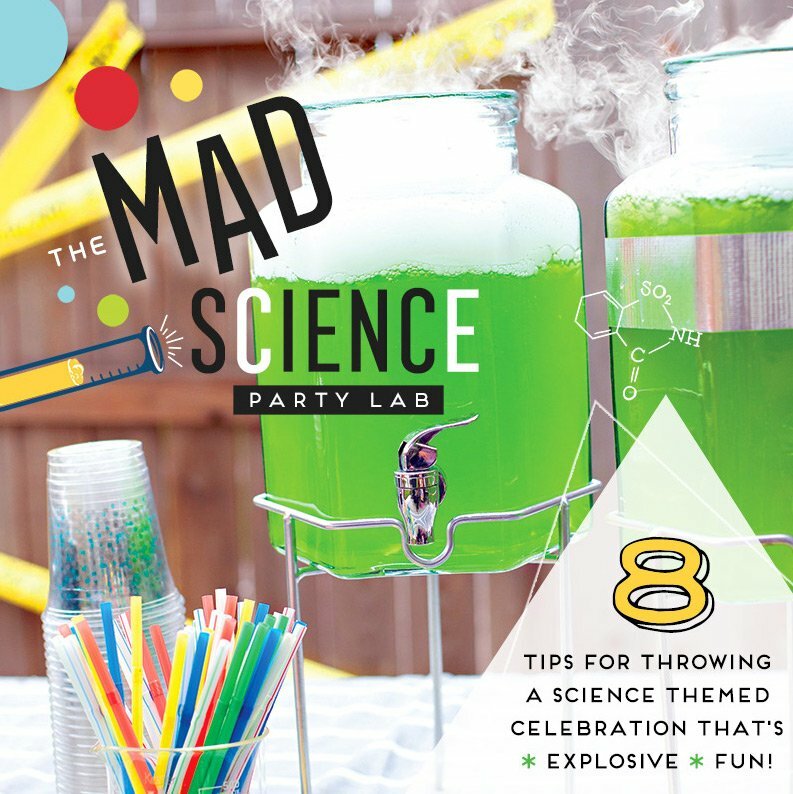 This is the perfect party idea! I love every single thing about it. 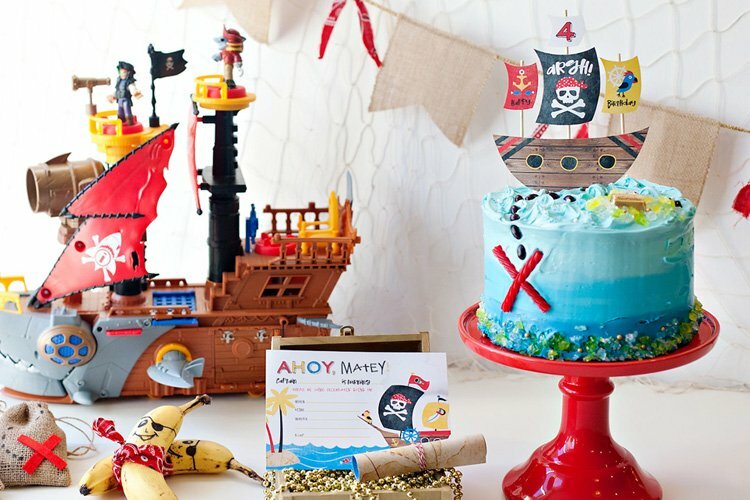 I NEED to have something like this for my next birthday. Such an inspiration! We are a new social network that spans content from the 50s-90s. Reliving memories from yesterday. We see that you have alot of retro things on your site. We were interested in your affliate program if you have one ,or simply sharing your info to your site on our page THE DINER which goes with what you are doing.We really love your site and would like to help if we can. 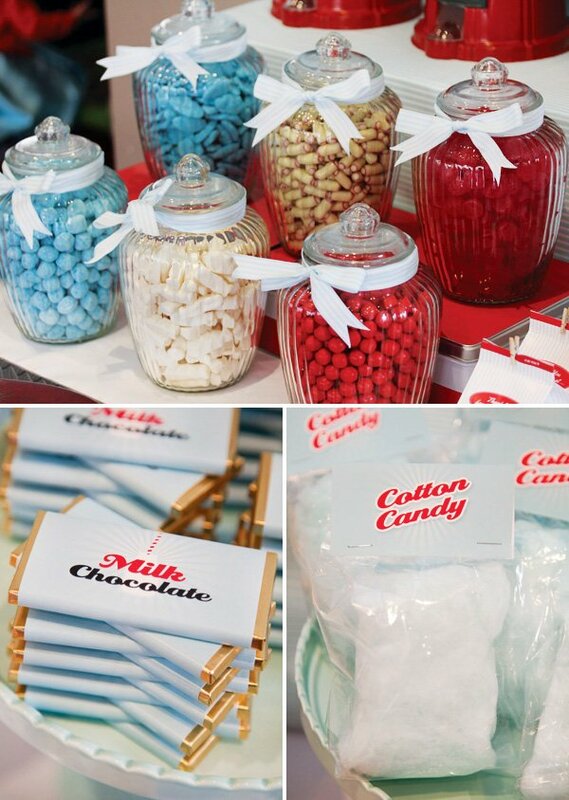 LOVE this sweet little theme! where did you find the favor boxes?